Microsoft chairman Bill Gates announced Friday at the World Economic Forum that his foundation would give $306 million to use green technology and farming techniques to boost millions out of hunger and poverty. The announcement by Gates, who is a long-time favorite speaker at the annual meeting of business and government leaders, injected a shot of optimism into the gathering which had been weighed down the first two days by fears of a global economic downturn. Gates, who is stepping down as Microsoft chair later this year and expected to focus more on philanthropy, received a standing ovation at the suggestion of anti-poverty campaigner and U2 frontman Bono. "It's a very special moment in time, I think, for Davos, and people here," said Bono. "This is Bill Gates' last trip to Davos as Microsoft leader and I think it is an extraordinary thing that this man has not just changed the world once, but has now set aside the next act of his life to change the world again, and I think we should just mark this moment." Gates said the foundation set up by him and his wife, Melinda would give the money to help millions of African farmers feed themselves and others and work their way out of poverty in a new green revolution using targeted technology and training. The Bill & Melinda Gates Foundation, which has concentrated on improving health in poor parts of the world, has decided it is time to improve agriculture, he told reporters. "Why do we think agriculture is so important?" said Gates. "Of the billion people who live on less than $1 a day, three-quarters are small farmers. And often it is actually the woman who is doing her best to both create crops for eating and earn some cash to buy other things." 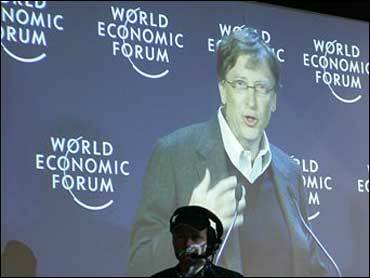 Gates on Thursday urged business to work with governments and nonprofit groups in a new kind of capitalism to stem global poverty and spur more technological innovation for those left behind. The program was partially inspired by the Green Revolution, a program designed to raise food production in Latin America, Africa and Asia. While the program has been deemed a success, it has been widely criticized for its heavy use of fertilizers, pesticides and lack of biodiversity, reports the Wall Street Journal. The foundation is trying to avoid those pitfalls in part by staying more focused on local conditions - of soil and people - than the Green Revolution did, said Rajiv Shah, director of the foundation's agricultural development program, according to the Journal. But despite the optimism, economic turbulence still lingered over the World Economic Forum's annual meeting. Indian Finance Minister Palaniappan Chidambaram said that the threat of a global slowdown would hurt his country, one of Asia's biggest economies. A "slowdown is a precursor to a recession and I think that is worrying," he said. "It is especially worrying to developing countries like India." The first two days of discussions in the five-day annual meeting of 2,500 leaders were devoted largely to what might be done to stave off recession and combat terrorism and conflict in global hotspots like Afghanistan, Pakistan and the Middle East. On Thursday the forum challenged - and heard challenges from - leaders from the Middle East and South Asia, with Israel's foreign minister calling directly on global business leaders to pull their money out of Iran, and participants voicing concern that elections under Pakistani President Pervez Musharraf would not be free and fair. Musharraf, on a European tour to build confidence after months of political turmoil at home, told business and government leaders that the elections would be transparent. He brushed off complaints about human rights, saying that combating illiteracy and poverty and fostering political stability were far more important if his country was to eliminate terrorism. Israeli Foreign Minister Tzipi Livni urged the leaders to take a personal stand against Iran's leadership by divesting from the country. "Iran exports terrorism, destabilizes the region, denies the Holocaust and threatens to wipe Israel, my home, off the map," said Livni, referring to Iranian President Mahmoud Ahmadinejad's frequent calls for the elimination of Jewish state. "If every company here and every country here would decide to divest from Iran, this would stop Iran," she said. "Iran is a global threat and Iran can be stopped by you."